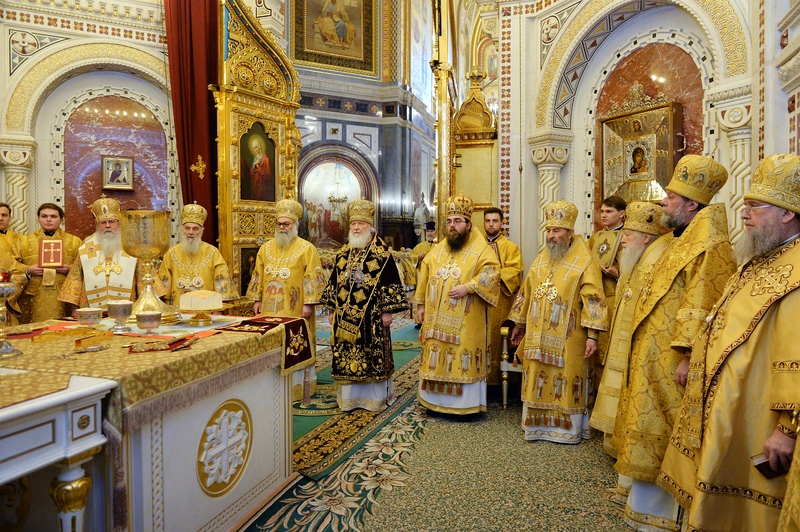 As reported earlier, His Beatitude, Metropolitan Tikhon and a delegation from the Orthodox Church in America joined the representatives of the Local Orthodox Churches for the celebration of the tenth anniversary of the election and enthronement of His Holiness, Patriarch Kirill of Moscow as Primate of the Russian Orthodox Church. Upon their arrival in Moscow on Wednesday, January 30, 2019, Metropolitan Tikhon and the delegation were greeted by His Eminence, Metropolitan Ignatius of Vologda and Kirillov; His Grace, Bishop Matthew of Sourozh; Archpriest Igor Yakimchuk, Department of External Church Relations’ [DECR] Secretary for Inter-Orthodox relations; and Dimitri Petrovsky, DECR staff member. 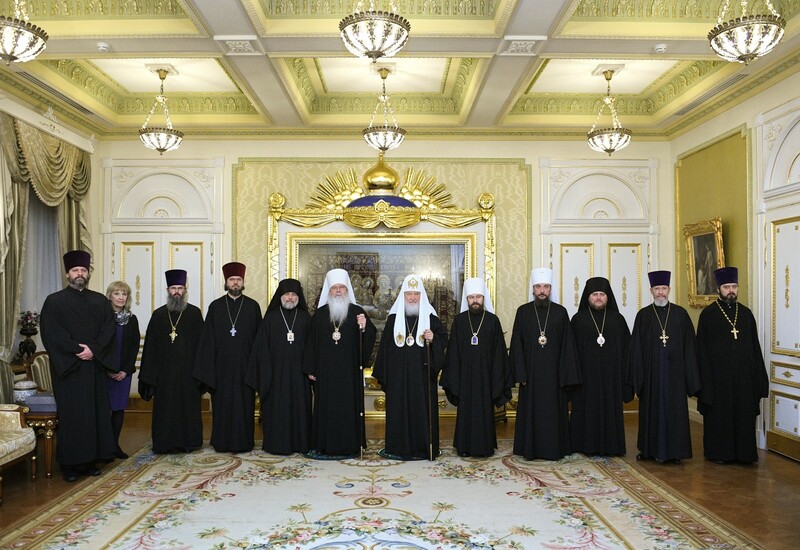 Patriarch Kirill welcomes Metropolitan Tikhon, delegation. In the evening, Metropolitan Tikhon and the delegation were received by Patriarch Kirill at the Patriarchal Residence at Moscow’s Danilov Monastery. After initial greetings, His Holiness welcomed Metropolitan Tikhon in the Patriarchal Chapel, where they venerated the holy altar before exchanging formal greetings and remarks. His Holiness went on to speak about the initiation of the Summer Institutes at Saints Cyril and Methodius Institute of Post Graduate Studies, which offers hospitality during the summer months to representatives of other Local Churches and offers an opportunity to get acquainted with the life of the Russian Church. In June 2018, a number of OCA clergy participated the inaugural program. His Holiness also spoke of his satisfaction with regard to the Patriarchate’s Representation Church of Saint Nicholas in New York City and the relationship it maintains with the OCA through His Grace, Bishop Matthew of Sourozh, Administrator of the Patriarchal Parishes in the USA. In response, Metropolitan Tikhon congratulated Patriarch Kirill on the occasion of the tenth anniversary of his enthronement and offered his “personal prayers for many more years of such steadfast service to Christ, to the Russian Orthodox Church, and to world Orthodoxy. “Our delegation from the Orthodox Church in America is grateful for the warm welcome offered to us by His Eminence, Metropolitan Ignatius of Vologda, and His Grace, Bishop Matthew of Sourozh, upon our arrival here in Moscow, and we look forward to the celebrations that have been planned this week,” Metropolitan Tikhon said, adding that Patriarch Kirill has “borne a tremendous burden with respect to recent developments in Ukraine, developments which are being debated by all the Churches but which have most directly and painfully affected the clergy and faithful of Ukraine. The Orthodox Church in America has articulated its position in the recent Archpastoral Letter of our Holy Synod of Bishops. Metropolitan Tikhon continued by offering examples of the positive relationship between the OCA and the Russian Orthodox Church; the desire to increase cooperation in the area of youth ministry, joint exchanges and pilgrimages; plans for the celebration in 2020 of the 50th anniversary of the granting of autocephaly and the glorification of Saint Herman of Alaska; and other matters of mutual interest. Metropolitan Tikhon especially thanked Patriarch Kirill for his support of Father Daniel Andrejuk and the ministry he exercises as OCA Representative to the Moscow Patriarchate and Dean of the Representation Church of the Great Martyr Catherine in Moscow. “One of the crucial projects for Father Daniel is the ongoing restoration at Saint Catherine’s, with which we hope to move forward especially in this year which marks the 25th anniversary of its establishment as the OCA’s Representation Church,” Metropolitan Tikhon said. 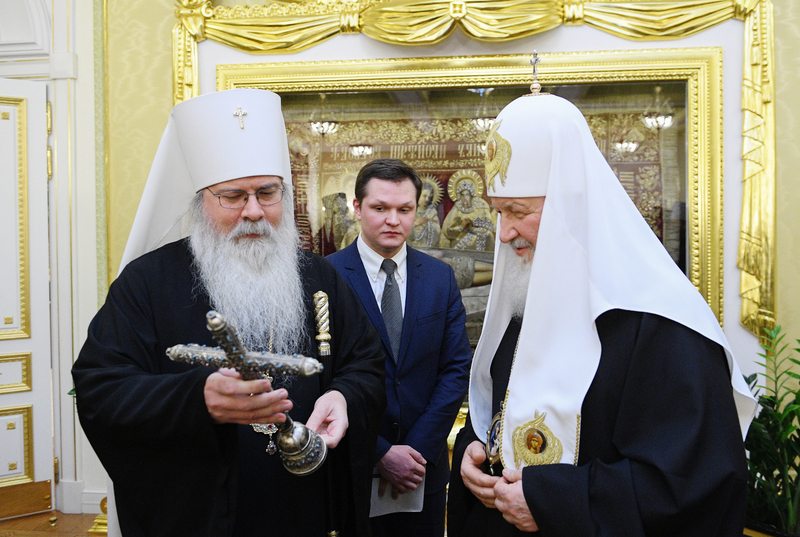 At the conclusion of their meeting, Patriarch Kirill presented a triple panagia set to Metropolitan Tikhon, who in turn presented a hand-crafted silver cross with jewels from the OCA Diocese of Mexico. Meeting with Serbian Patriarch, US Ambassador, Canadian Charge d-Affaires, and anniversary concert. On the morning of Thursday January 31, Metropolitan Tikhon met with His Holiness, Patriarch Irinej of Serbia, at which time they discussed the current situation of their respective Churches and discussed possible fraternal visits in the future. Metropolitan Tikhon and the OCA delegation then visited the United States Embassy to Russia, where they were received by Ambassador Jon Huntsman and met Canada’s interim Charge d’Affaires, Stephane Jobin. Ambassador Huntsman thanked Metropolitan Tikhon for the important role in the international community played by Saint Catherine Representation Church, which the Ambassador visited for the annual 9-11 Memorial Service and on numerous other occasions. On Thursday evening, Metropolitan Tikhon and delegation members attended a concert in honor of Patriarch Kirill and the tenth anniversary of the Russian Church’s 2009 Local Council, at which His Holiness was elected to the Patriarchal Throne. 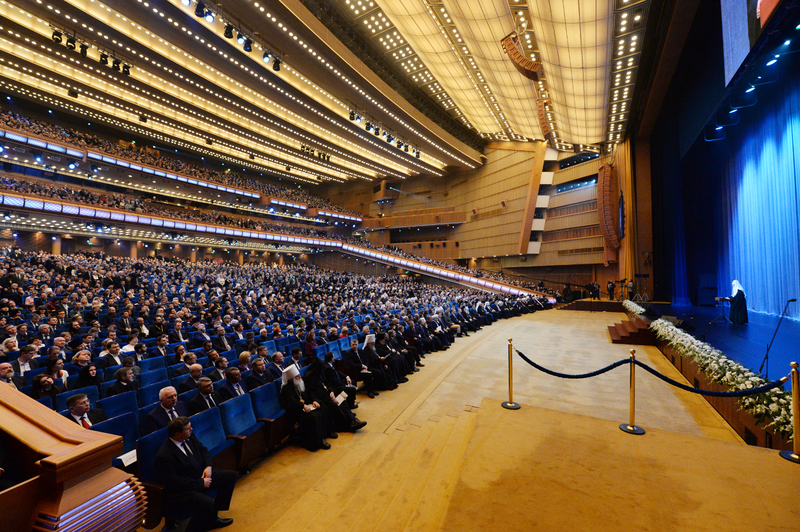 A choir of 700 voices performed the concert, which featured pieces by numerous Russian composers, at the State Kremlin Palace. Visits to the Donskoy and Sretensky Monasteries. Metropolitan Tikhon and the OCA delegation visited Moscow’s Donskoy Monastery on Saturday, February 2, where they were received by His Grace, Bishop Paramon, Bishop of Bronnitsy and venerated the relics of His Beatitude’s heavenly patron, Saint Tikhon the Confessor of Moscow that are enshrined in the monastery’s Cathedral of the Don Icon of the Mother of God. 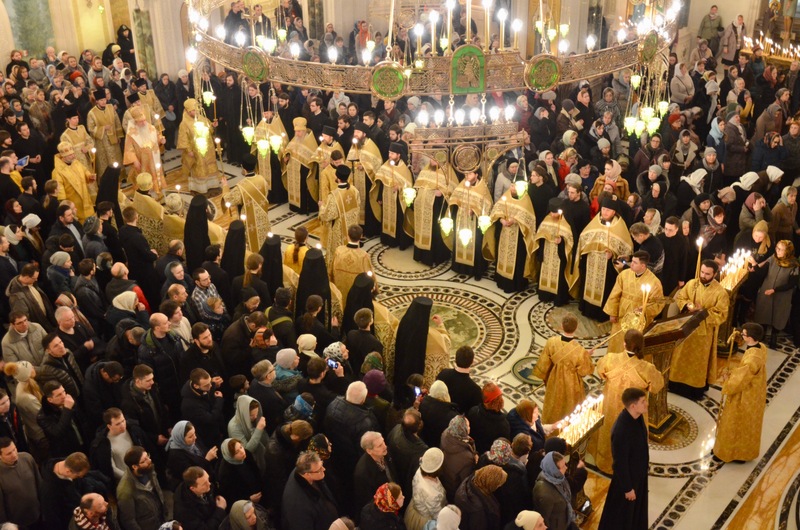 They also visited the Sretensky Monastery and Seminary in central Moscow, where Metropolitan Tikhon and Bishop Daniel served at the All-Night Vigil with Bishop Matthew. Sunday Divine Liturgy at OCA Representation Church. 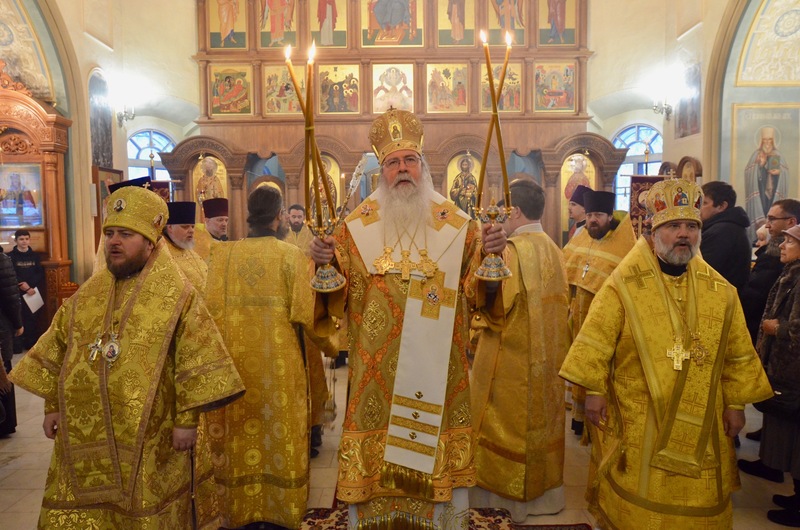 The following morning—Sunday, February 3—Metropolitan Tikhon, Bishop Daniel and Bishop Matthew concelebrated the Divine Liturgy at the OCA Representation Church of the Great Martyr Catherine, where they were welcomed by Father Daniel Andrejuk. Concelebrants included Father Alexander Rentel; Archpriest Leonid Kallinin, Director of the Church of Russia’s Architecture and Renovation Department; Archpriest Alexei Kurenkov, Rector of the Belgorod Seminary and a graduate of Saint Tikhon’s Orthodox Theological Seminary, South Canaan, PA; Archdeacon Joseph Matusiak; and the parish clergy. [A series of videos of the Divine Liturgy is available online.] Following the Divine Liturgy, Metropolitan Tikhon thanked Father Daniel and Matushka Vera as they begin their second year of service in Moscow. After enjoying a luncheon at Saint Catherine’s Church, Metropolitan Tikhon and the OCA delegation departed for the airport, accompanied by Metropolitan Ignatius, Bishop Matthew, Father Igor Yakimchuk, and Dmitri Petrovsky, for their return flight to the US.